We created these rings because so many brides have a solitaire engagement ring with a pear, marquise, asscher, princess or emerald cut centre diamond or their main diamond may have tapered baguettes or baguettes on the shoulders. The Antwerp Collection offers a beautiful new look and they all look wonderful on their own. 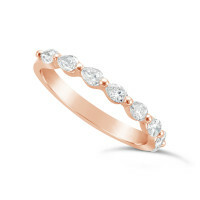 All seven bands are available in Platinum or 18ct White, Yellow or Rose Gold. 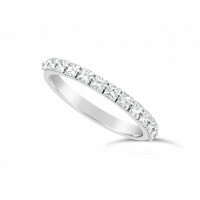 All the diamonds we use are a G Colour and a VS Purity. 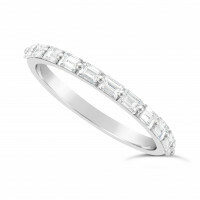 These diamonds are exclusively cut for us to give you the maximum look in the minimum width. Fine Quality 18ct White Gold Unique Narrow Marquise Cut Wedding Band Set With 8 Diamonds, Total Diam..
Fine Quality 18ct White Gold Unique Narrow Asscher Cut Wedding Band Set With 13 Diamonds, Total Diam..
Fine Quality 18ct White Gold Unique Narrow Emerald Cut Wedding Band Set With 11 Diamonds, Total Diam..
Fine Quality 18ct White Gold Unique Narrow Princess Cut Wedding Band Set With 13 Diamonds, Total Dia..
Fine Quality 18ct White Gold Unique Narrow Baguette Wedding Band Set With 11 Diamonds, Total Diamond..
Fine Quality 18ct White Gold Unique Pear Shape Wedding Band Set With 8 Diamonds, Total Diamond Weigh..
Fine Quality 18ct White Gold Unique Tapered Baguette Shape Wedding Band Set With 10 Diamonds, Total ..